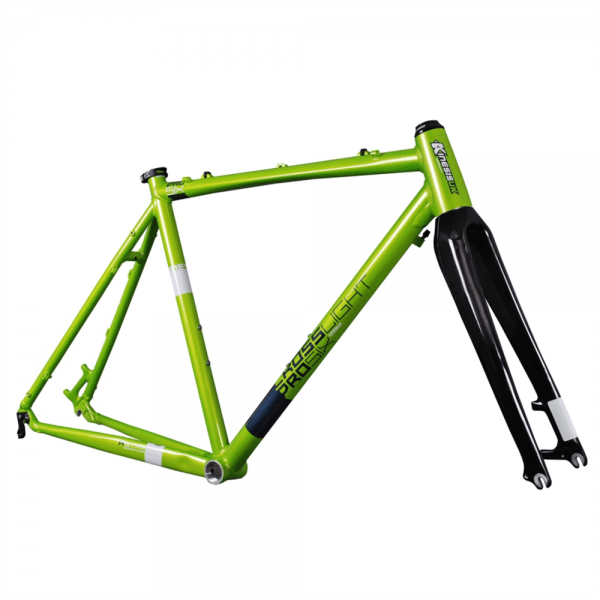 The Crosslight Pro6 is not the first disc compatible, Cyclocross race frame that we have produced, in fact the first ‘Crosslight Pro’ [circa 2001] had disc mounts on the frame and fork because I thought it made sense to keep your braking surfaces out of the muddy grinding paste. The Pro6 is a race bike first and foremost and uses our proven race geometry. It’s designed to come out in front after an hour of elbow to elbow pedalling, vaulting and running. In addition, it has eyelets to allow the fitment of ‘guards, rack and bottles if you are that way inclined. It’s not supposed to be a ‘Jack of all trades’, but it is designed to be practical and adaptable as well as FAST. It is disc brake only [no canti-bosses]. Discs make sense for CX, they mean consistent braking throughout the race and mean your expensive deep section carbon rims will last longer! Braking is not of utmost importance during a CX race, but with the advent of more disc equipped CX bikes, I can see out-braking into corners being used to far greater effect. With UCI approval for discs in CX, many manufacturers are working on disc systems and adapters for drop bar levers and also decent lightweight disc-wheels. • Tough Kinesium tubeset with taper headtube and 'CXD' 500g, full UD carbon monocoque, 1-1/8">1.5" taper-steerer fork. Fork is eyeletted at dropouts and rear of crown and has hose clip on rear of LHS blade. • ‘Ergo2' profiled top tube for comfortable carrying, oversize...but not TOO oversize, Kinesium down tube, it's not too fat to grab with muddy gloves and isn't a 'mud magnet'. • Sensible head tube lengths. Cyclocross is all about explosive acceleration and short sharp climbs. Towering 'comfortable for the commute' head tubes put the bars in your chest and don't work for racing. You can add up to 40mm of spacers if you want to press it into service as a commuter. • Post-mount on frame and fork for easy fitting and adjustment. • Eyeletted for ‘guards, rack, bottle cages. • Routing is on RHS of top tube, out of the way of your neck when carrying, it’s designed to take a full outer cable [for max mud/water resistance] or a hose for hydraulic discs. • New Kinesis UK designed, forged dropouts [135mm hub spacing]. • FSA Taper headset included. • Kinesis seat clamp included. Changing from the neutral-riding Colnago elevated our senses to new levels, as the Pro 6’s low, aggressive position and fast handling kept us on our toes. At 9.62kg including the lightest wheels, it proved lively…the Kinesis was a nimble climber and the compact bar was a boon on the flat, enabling us to stay on the drops longer. Descending the banks, the Pro 6’s newly relaxed head angle and tapered carbon steerer-tube were immensely stable, with Tektro’s Lyra discs offering bags of feel and power, enabling usto gain ground before the dismount. The Pro 6 was a joy to pick up, the smaller diameter tubing leaving extra shouldering room, and its beautifully flattened top-tube made it the most comfortable machine to run with. "Fast and sharp, this great value package will deal well with muddy ’cross races"